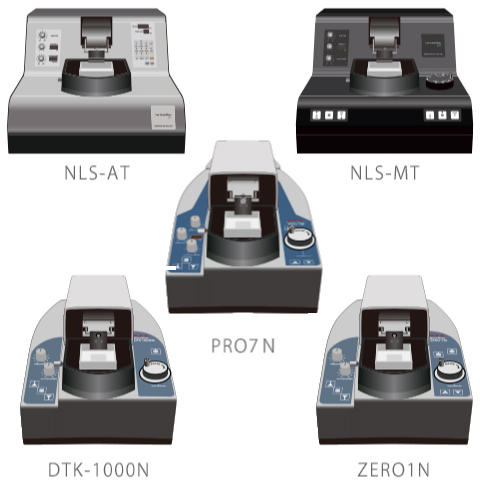 Neo-Linear Slicers (NLS) are the next-generation models of slicing machines available since 2014. 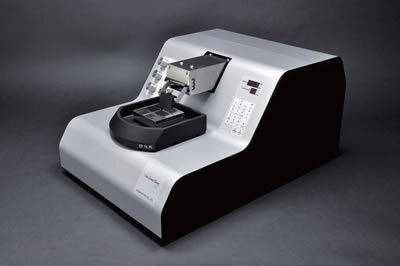 Linear Slicers (LS) have been in production since 2001, and the Micro Slicer (MS) has been around for more than 30 years. NLS are the most advanced models of LS compared to the least advanced MS models, although the basic mechanism is almost the same. They each offer varying degress of performance versus cost-effectiveness. The difference between NLS, LS and MS is in the horizontal swing mechanism, while MS is swinging sideways from the DC motor via cam. NLS and LS are transversely swung with electromagnets (linear motor type). Although it is impossible to suppress the vertical swing which would inevitably create a bad vibration with the mechanism of the motor and the cam, the linear motor with only the linear motion (horizontal swing) theoretically, even if various conditions such as the resonance of the chassis and the cover were put in, reduces the longitudinal shake to approximatedly 1 µm (2 µm even at maximum swing). 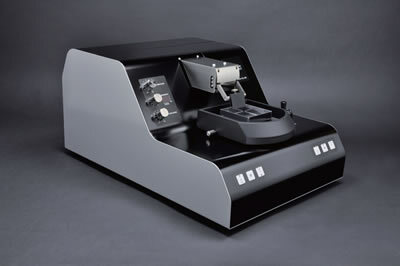 In the NLS series, a vibration suppression table is built in, shrinking the vertical swing further, thus becoming soft. In test demonstrations, we received positive feedback including: "Synapse's response (liveliness) is good," and "Even those who are unfamiliar are able to cut cleanly, " and "Good condition is obtained". Improving on the original success of the MS series with it's higher basic performance than competitors' comparable products, the LS series is the next highest model in the lineup. the DC motor will degrade as much as you use it by nature and the torque will decrease. Depending on the frequency of use, the motor may show signs of wear in three years. On the electromagnet, there is no such degradation, however, it's best to adjust it once every few years. Although NLS and LS models demonstrate the best performance in raw samples, it is due to the difference in the lateral swing mechanism described above that the fixed specimen can be cleared more than MS. It is the LS series that can cut thinner more beautifully, and the NLS series is even better. 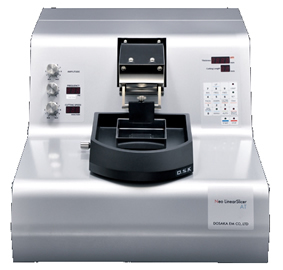 The most cost-effective model, the Micro Slicer Model DTK-1000N is an entry-level model of our slicer series, It features manual operation of the elevating mechanism which controls section thickness. Instead of increasing the labor of turning the dial around the dial when making slices, the price is kept low. The ice bath has become detachable and easy to use. In addition, the magnifying glass has become an option. The Micro Slicer Model ZERO 1 N is the next best model, where the stepping motor is mounted on the elevating mechanism of the specimen part, making it more convenient to use. 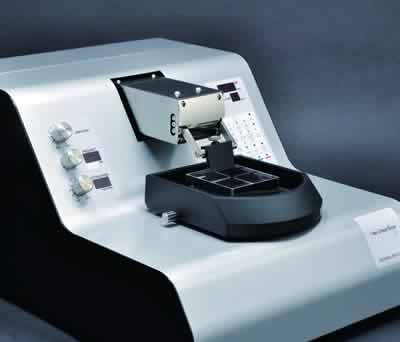 When retracting the blade with retraction function, it is also beneficial to mount the stepper motor to lower the sample by about 100 µm so that the blade and the sample do not come in contact with each other. This too features a detachable ice bath and optional magnifying glass. Linear Slicer Model PRO 7N with a horizontal electromagnet swinging mechanism raises the basic performance of MS linear slicers. 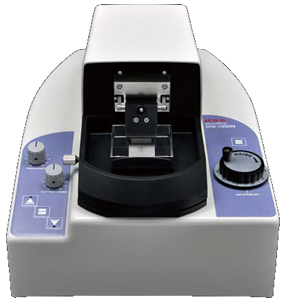 This semi-automated machine with retraction function is similar to Micro Slicer ZERO 1 N's operability. The ice bath has become detachable and easy to use. 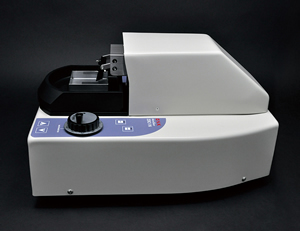 Neo-Linear Slicer MT is Linear Slicer PRO 7N's successor. Built-in vibration suppression table reduces longitudinal runout. The sharpness improved further. Semi-auto machine that inherited simple and easy operability of PRO7. The blade holder and ice bath become removable and easy to clean. The blade holder also supports sterilization, and customization of the incident angle is also available as an option. 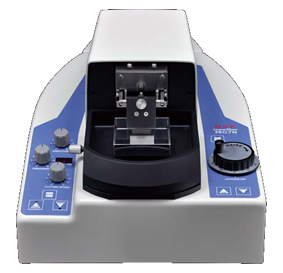 Model AT feature all the benefits of the MT as well as incorporates automatic programming controls and a vibration suppression table. Large Ice Bath, 500 mL cap. The further evolution of vibrating blade tissue slicers. 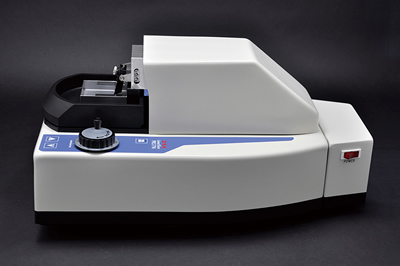 Available in two models, the high performance Neo-Linear Slicer AT model and the standard Neo-Linear Slicer MT model, these slicers provide excellent performance when it comes to producing better, much thinner, sections of live tissues. Each uses steel plate housing instead of plastic to eliminate defective vibrations caused by resonance as much as possible. Both feature conveniences such as detachable, sterilzable blade holders and deep ice trays. The flagship AT Tissue Slicer has automatic functions, making it very useful when you need a large number of slices or when making continuous sections. The auto control program and control platform has been modernized, providing for easier workflow and maintance. Available options include a loupe, a magnification mirror with LED lighting, and a large ice bath with designated speciment tray. The advanced model electromagnet-generated linear vibration. 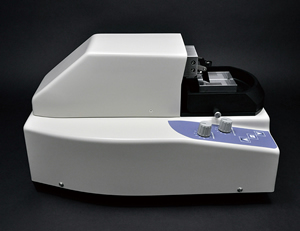 The Linear Slicer is the first to feature lateral vibration by linear motor (electromagnet) in the world. This model, which drastically reduces poor vibrations and minimizes the death of nerve cells, will definitely help with research activities. The swing width can be adjusted without changing the vibration frequency. Additionally, the advance speed is adjustable. Available options include a loupe and a large, removable ice bath with designated speciment tray. 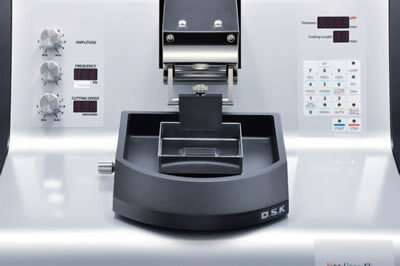 Available in two models - the automated MicroSlicer Zero1N model and the lower-cost manually operated DTK-1000 model - are the standard models for cutting live tissues. 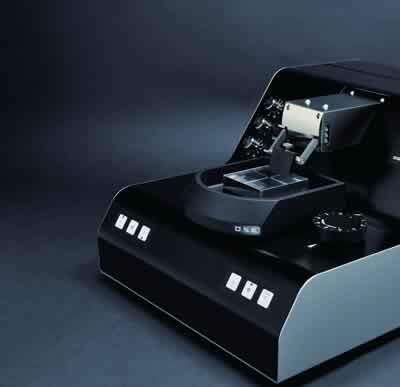 In the Zero1N Model, vertical up and down movement of the specimen is made electrically by a built-in stepping motor. The built-in retraction mechanism lowers the specimen after each sectioning to protect the damage of the specimen surface by the blade backing to the initial position. This improves usability and performance. 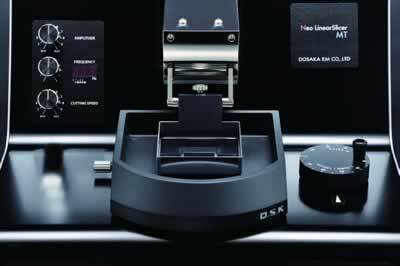 The DTK-1000 Model, combines high basic performance and economic efficiency. The retraction mechanism is not available in this model. Available options include a loupe and a large ice bath with designated speciment tray. 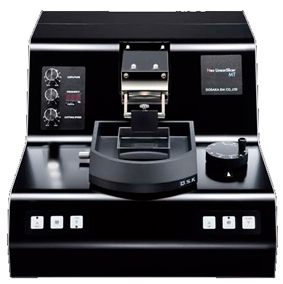 Electron Microscopy Sciences is committed to offering you the most up to date equipment on the market. If you have any ideas or would like to see us make any changes in our line please let us know all ideas and suggestions are encouraged. We look forward to hearing from you.